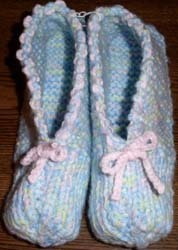 I am now using Lion Homespun, so slippers are extra-soft and fuzzy. No photos available yet. Comments: These are thick, stretchy slippers. 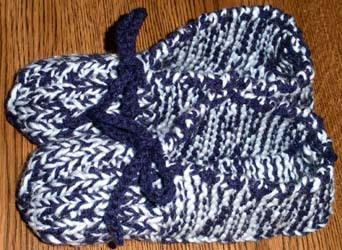 The tie is woven through the top edge so they can be tightened if they stretch.They are my variation of the common knit slipper pattern. 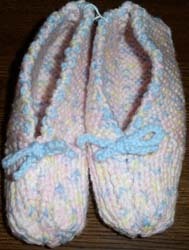 Colors: Pink, purple, autumn-toned variegated, sky blue or e-mail me with color requests. 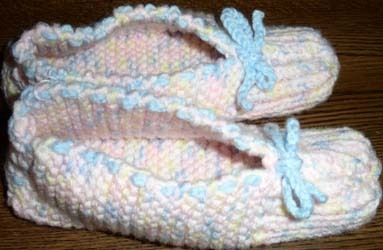 Size: Pastel slippers are approx. 8" long unstretched, but they are VERY stretchy. Fits women's size medium-large, or women's size 7-9. 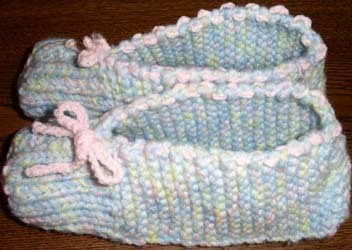 To order: Refer to "slippers" and give color choice. Custom: E-mail me with color or size requests. I can make them larger or smaller. 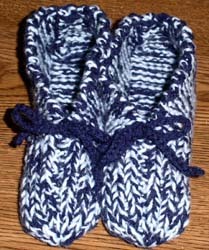 Shipping: $2 for one pair, $1 for each additional pair shipped at the same time.